Diversity is the name of the game in Central Florida, a transition zone with some of the state’s longest stretches of trail and awesome rugged hikes in the Central Highlands. With its massive population centers, the region is also home to many short nature trails that enable urban dwellers to explore natural Florida in their own backyard. You can climb to the top of a 50 foot sandhill and survey the scrub as scrub-jays play in Lyonia Preserve, wade through coastal pine flatwoods on Merritt Island, walk the vast open prairies at Hal Scott Preserve, and clamber over the rocky rim of a giant sinkhole as you backpack the 43 mile circuit at the Citrus Tract of Withlacoochee State Forest. Explore these 50 sites for your hiking pleasure, from a 1-mile loop around a sinkhole to a 4-day backpacking trip. 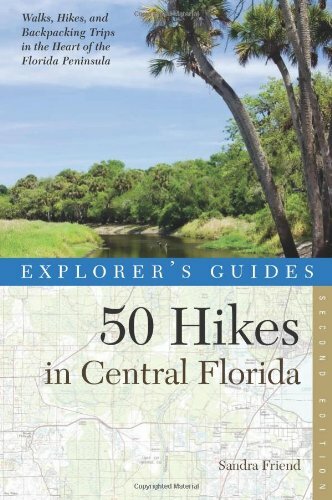 This second edition guidebook is fully updated, with every trail revisited – and nearly half of them replaced to spur you to get outside and explore new ground throughout Central Florida.